Just steps from the Champs-Elysées, on the Georges V Avenue, Four Seasons Hotel George V features private terraces with commanding Paris city views, signature lavish flower displays imagined by Jeff Leatham, top-of-the-line spa treatments and Michelin-awarded dining. The palatial rooms and suites, many with private terraces overlooking the city of Paris, are fitted with an interactive TV, CD/DVD player and library and WiFi access. Espresso coffee machine with complimentary coffee pods, safe, mini bar, and in-room bread toasting service are standard. Four Seasons Hotel George V, Paris provides three restaurants recognised by the coveted Michelin Award for a total of 5 stars. Classic French cuisine and lighter menus have earned Le Cinq restaurant three Michelin stars. The chic La Galerie is a favourite spot among fashionable Parisians for a drink or light bite. Le George offers light Mediterranean cuisine designed for sharing. The 7-metre high conservatory offers views of the marble courtyard and houses the Orangerie Restaurant, where guests will be able to enjoy French Traditional cuisine with a contemporary touch. Both Le George and L'Orangerie has 1-Michelin star. Le Bar proposes cocktails and light meals and its large windows open on to the famous Avenue George V.
The spa, spread over 720 square metres, includes a 17-metres swimming pool, vitality pool with hydro-massage water experience circuit heated to 34°C, a 90 m² cutting-edge fitness room, and a stylish hair salon. Moreover, other facilities include valet and concierge service, as well as meeting and banquet facilities with dedicated staff. Just 1.6 km from Eiffel Tower and 3.5 km from Musée d'Orsay, Four Seasons Hotel George V Paris enjoys an ideal location in the Golden Triangle, famous for high-fashion boutiques. 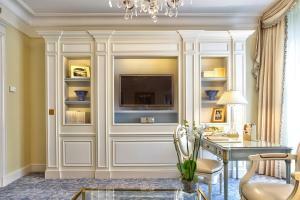 It is also 3.5 km from the trendy shops and cafes of St. Germain-des-Prés. The hotel offers parking at an extra cost. Please note that an American breakfast is also available and costs € 59. Superior Rooms offer you peaceful views of the hotel's garden and marble courtyard, the whimsical West Garden or bustling Avenue George V and Avenue Pierre 1er de Serbie. Rate: € 926.50 ... € 3350.00; select dates below to get current rates. 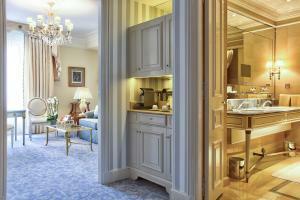 Airy, gracefully-appointed deluxe rooms boasting crystal chandeliers. 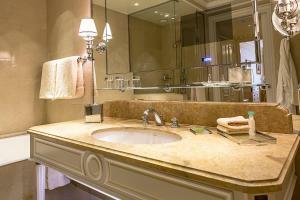 Features a marble bathroom with relaxing, soaking tub and separate shower. Extremely spacious Premier Rooms offer views of the Marble Courtyard and the surrounding avenues. Large windows boast views of Avenue George V, the elegant Marble and Pierre 1er de Serbie courtyards and whimsical surrounding avenues. Gracious suites, with an entrance foyer leading to the large sitting room and the bedroom discreetly secluded by sliding doors. Boasts sparkling chandeliers and a generous seating area outfitted with elegant period furniture, a large work desk and all the modern amenities. With the ambience of a Parisian apartment and graced with antiques and fine art, the deluxe suites offer a variety of city views. 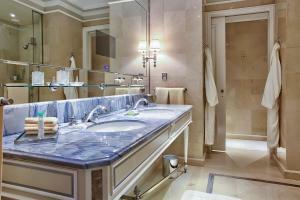 The lavish master bathroom is appointed with marble, a deep soaking tub and a separate shower.